Little by little, or poco a poco as they say in Mexico, the San José Iglesia Católica – St. Joseph Catholic Church – in La Cholla is becoming a beautiful house of worship. 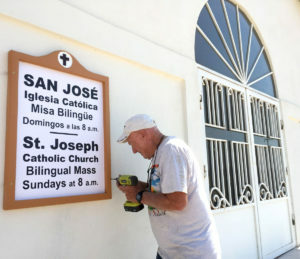 San José is a mission church of Our Lady of Guadalupe Catholic Church in Puerto Peñasco, and is the only Catholic Church in the city offering bilingual Mass. Scripture from the Old Testament, New Testament and Gospel are read in both Spanish and English. The hymns are sung with verses alternating English and Spanish, and the sermon/homily is delivered in Spanish and translated to English by a lay minister. This week a big new sign (in Spanish and English) went up on the front of the church to let people know that Mass is celebrated every Sunday at 8 a.m. Bids are currently being sought for wiring the church now that electricity has been brought to the property; and plans have been drawn for a sacristy and bathroom addition to the building. Everyone, especially all Catholic visitors, are invited to make the short drive out to La Cholla for Sunday Mass. Those who cannot attend but would like to help, can send a check payable to San Jose Building Fund. Checks can be mailed to Bob Keller, Sexton of San José, at Post Office Box 297, Lukeville, AZ 85341-0297. Or call Keller at 928-706-6928 for more information. 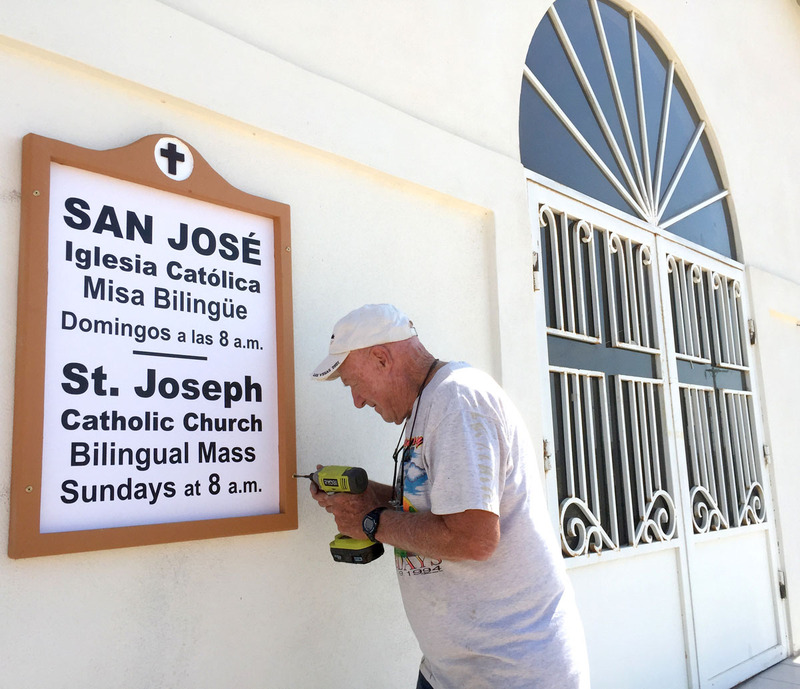 San José Sexton, Bob Keller, affixes a new sign to the front of the San José mission Church in La Cholla, near Cholla Bay, announcing the bilingual Mass each Sunday at 8 a.m. All are welcome.